Developing alumni relations to embed and enhance employability and enterprise. 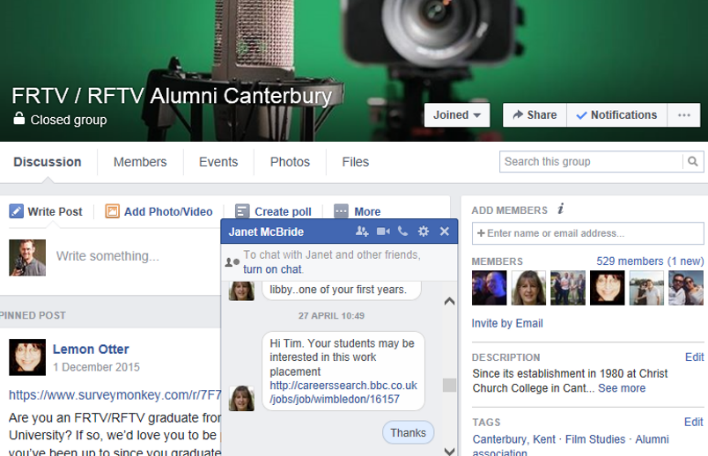 This case study explores how the development of relations with former students, particularly through social medial platforms and alumni video embeds and enhances employability and an enterprise mind-set in the Film, Radio and Television Studies degree at Canterbury Christ Church University. The project is led by Dr Ken Fox and Tim Jones from the School of Media, Art and Design. The case study identified how the “returned” have helped to inspire, promote and develop a sense of pragmatic optimism in the current students. The case study uses student and alumni feedback, networking contacts to discuss the development of an alumni strategy focused on Facebook and Linkedin groups that ensures alumni will continue to be the “Returned”. The production of a short video, shot by former students and containing alumni as guest speakers, offers an insight in to how the “returned” have been incorporated in to the curriculum through the Professional Perspectives strand. Build the necessary resource into the Business Plan (50-100 hours) to set up the sites and provide ongoing regular elements to keep them current and vibrant. Seek help from director of alumni, Digital Communications team to help build a 12 month editorial plan. Make a video to highlight how alumni play a vital part in inspiring current students and acting as role models for employability and enterprise. Identify recurring elements to be posted to keep the sites current, now and then, Ken’s moments of Zen, posting of job, intern, crewing opportunities, alumni/a successes. Have an end of year event as a focus (FRTV Best of Screenings) where we invite alumni. Gather evidence through survey identifying mentors, volunteers. Develop a plan for dealing effectively with this information. At the beginning of their final year, level 6 students have the option to sign up so they can access the network of over 600 existing alumni on Facebook. Feed into University Alumni activity, the Link, annual alumni dinner. Nominate alumni who meet criteria for alumni volunteer of the year or Honorary Doctorates or Fellowships. As the three years of the Professional Perspective strand is rolled out, we will evaluate its impact and identify through student evaluation, staff perception and peer feedback how the strand can be improved. We have already anecdotal feedback from alumni on how they have used the Facebook group to network, gain work experience and freelance employment. The benefits of this approach can be seen in the growing number of alumni who are willing to return as guest speakers and post work opportunities on Facebook and Linkedin. Alumni are visible as positive role models to current students through their interaction with social media and their role as virtual mentors. A stronger sense of community has been established between alumni and current students with the shared experience of being an FRTV students. One of the main challenges is to keep the Facebook pages fresh and updated. Although this has happened quite naturally through alumni involvement and regular contributions, it needs to be reviewed regularly. As social media platforms evolve and popularity for particular platforms wane, it will be necessary to evaluate the effectiveness of Facebook and Linkedin. If you want to know more about this case study, please contact. I’m really happy to read about this project. My background is in Development and Alumni Engagement, and I believe that alumni are a brilliant resource – especially, in terms of knowledge and support. 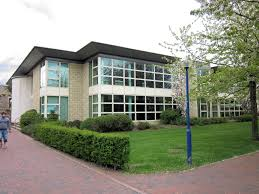 I am still in touch with my previous university, and I love still being associated with it. My previous university is a place I have a large amount of affection for, so I enjoy being contact by them and getting involved in the work they do.